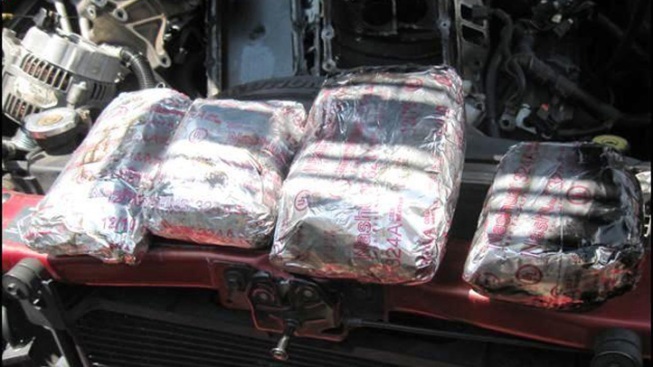 The four foil-wrapped bundles, which weighed 11.1 pounds and were worth an estimated $133,200 in street value, were found in a non-factory compartment inside suspect's 1999 Dodge Durango intake manifold. "They're not lying when they say you get addicted right away. I started shooting up every single day." His name is Robbie, and he is a recovering addict. His frank account made it plain, this was no typical public meeting. Families and advocates came seeking solutions to the rise in heroin abuse. "In the last year, we had over 100 heroin arrests here in Santa Clarita Valley," said City Councilman Frank Ferry. "In the last year, we've had nine fatalities as a result of heroin." Deputies displayed drug scales disguised as cellphones, along with pipes and needles, so parents would know what to look for. One couple talked on video about their son's deadly overdose. "I didn't know heroin was in Santa Clarita Valley," said a tearful mother. "I didn't know you could do it once and that would be it." The night was mostly about shattering stereotypes. "It took my son from graduating with honors as a senior to being arrested three times for stealing to support his habit," said Krissy McAfee, who lost her son to heroin. "There's no common thread," said Kathy Hunter from the Hart Union School District. "It was all over the place with ethnicity, socioeconomic background, academic performance." Audience members praise the turnout but said the attention is overdue. "I'm glad to see the city's getting its head out of the sand," said Susan Kasdorf of Newhall. "Been a problem out here for a very long time." There was a consensus that educated parents are the first line of defense. "They need to lock their prescription medications," said Captain Paul Becker from the L.A. County Sheriff's Department. "That's generally the trail to heroin - the Vicodin and Oxycontin that is found in the medicine cabinets in your home." Authorities bring tough talk, sad stories to public meeting in Santa Clarita. The Sheriff's Department hopes that parents and students will dig deeper into the threat, using resources like www.heroinkills.org and others. "This is a problem we need to face together," said Mayor Marsha McLean. "Heroin kills. We don't need to lose any more sons and daughters in Santa Clarita."